Memucan Hunt Allen married Mary White. Mary White married Memucan Hunt Allen. Raymond G. Ederer was born on 22 November 1912 at Plain, Sauk, Wisconsin. He was the son of Joseph Ederer and Margareth Paulus. Raymond G. Ederer married Caroline L. Ferstl, daughter of Henry H. Ferstl and Lillian Needham, on 26 November 1938. Raymond G. Ederer died on 24 September 1998 at Sauk, Wisconsin, at age 85 Raymond G Ederer obituary. Raymond G. Ederer obtained US Social Security Card at Wisconsin; last residence Sauk City, Sauk, Wisconsin. (?) Meeker married Florence Ferstl, daughter of Henry H. Ferstl and Lillian Needham. Richard Ederer was born after 1938. He was the son of Raymond G. Ederer and Caroline L. Ferstl. Richard Ederer married Marilyn Rae Zick, daughter of Reuben George Zick and Vernus Ann Leidig, on 26 October 1968. Married Name 26 October 1968 As of 26 October 1968,her married name was Ederer. Marilyn Rae Zick was born on 29 June 1944 at Baraboo, Sauk, Wisconsin. She was the daughter of Reuben George Zick and Vernus Ann Leidig. Marilyn Rae Zick married Richard Ederer, son of Raymond G. Ederer and Caroline L. Ferstl, on 26 October 1968. Marilyn Rae Zick died on 15 June 2004 at age 59 Marilyn Rae Ederer, 59, passed away Tuesday, June 15 at St. Mary's Hospital in Madison. She was born in Baraboo June 29, 1944, the daughter of the late Reuben and Vernus (Leidig) Zick. She was united in marriage to Richard Ederer on Oct. 26, 1968. Marilyn was formerly employed at Badger Ordnance. She and her husband owned Rose's Bar in the 1970s, and she was also an Avon representative. Marilyn enjoyed birds, flowers, camping and country drives. She was a member of St. Aloysius Catholic Church. She is survived by her husband, Richard of Sauk City; daughter, Karla (fiance Mike Hefty) of Sauk City; sister, JoAnn (Ivan) Steckelberg of North Freedom; mother-in-law, Carrie Ederer of Sauk City and other relatives and friends. A Mass of Christian burial will be held at St. Aloysius Catholic Church, Sauk City, on Friday, June 25, 2004 at 10:30 a.m., with Father Kevin Holmes officiating. Burial will follow in St. Aloysius Cemetery. Friends may call at the church today, June 18, from 9:30 a.m. until the time of Mass. Married Name 27 November 1935 As of 27 November 1935,her married name was Zick. Married Name 27 April 1979 As of 27 April 1979,her married name was Rothacker. Vernus Ann Leidig was born on 25 January 1915 at Honey Creek, Sauk, Wisconsin. She was the daughter of Rudolpf Leidig and Annie Kaufman. Vernus Ann Leidig married Reuben George Zick, son of Edward Melchoir Zick and Ella Marie Luise Allert, on 27 November 1935. 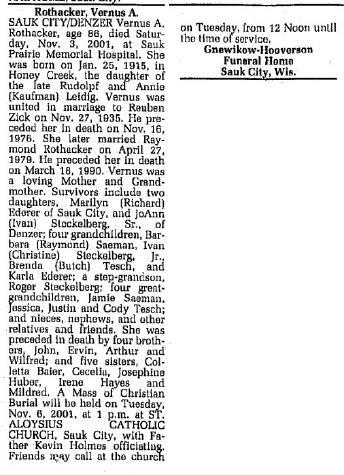 Vernus Ann Leidig married Raymond Rothacker on 27 April 1979. 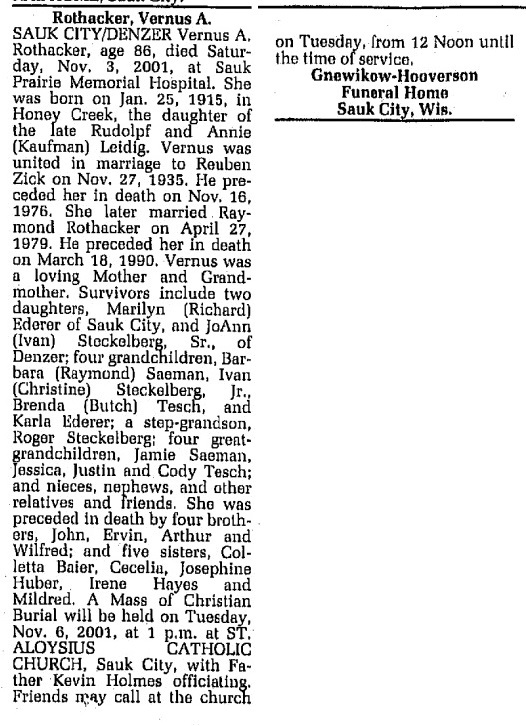 Vernus Ann Leidig died on 3 November 2001 at Sauk, Wisconsin, at age 86 Vernus (Leidig) Zick Rothacker obituary. Name Variation Marvin Alt was also known as Ederer surname of step-father. Marvin Alt married Joan (?). Marvin Alt was born circa 1936. He was the son of Clarence Alt and Caroline L. Ferstl. Marvin Alt graduated in 1954 at Reedsburg High School, Reedsburg, Sauk, Wisconsin, and was senior class president. Married Name Her married name was Alt. Married Name Her married name was Ederer. Joan (?) married Marvin Alt, son of Clarence Alt and Caroline L. Ferstl. Joan (?) died before August 2010. 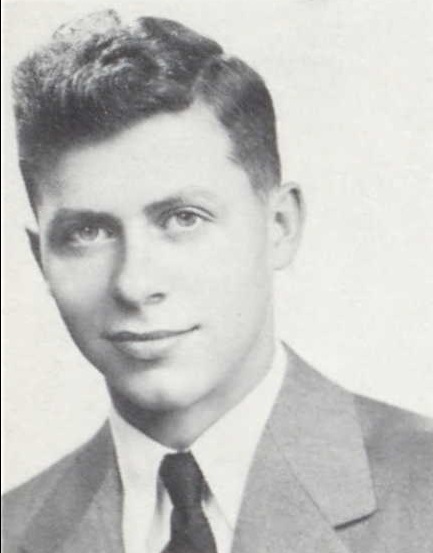 Donald Ederer was born after 1940. Donald Ederer married Marlene Rosalia Ganser, daughter of Arthur L. Ganser and Theresa Werla, on 25 October 1960. Married Name 25 October 1960 As of 25 October 1960,her married name was Ederer. Marlene Rosalia Ganser was the daughter of Arthur L. Ganser and Theresa Werla. Marlene Rosalia Ganser married Donald Ederer, son of Raymond G. Ederer and Caroline L. Ferstl, on 25 October 1960. John A. Shanor married Emma Louise Conrad after July 1912. Ronald Ketter was the son of Maurice Ketter Sr. and Julia A. Wiebelhaus. Ronald Ketter died before 2002. 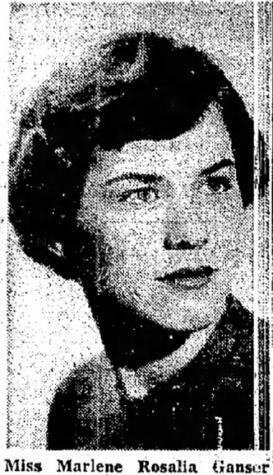 Sandra Ketter was the daughter of Maurice Ketter Sr. and Julia A. Wiebelhaus. Sandra Ketter died before 2002. Harold Jaeger married unknown (?). Married Name Her married name was Jaeger. Unknown (?) married Harold Jaeger. Charles K. Ard married unknown (?). Married Name Her married name was Ard. Unknown (?) married Charles K. Ard. John Joseph Magli was born on 23 June 1912. He was the son of Wilhelm Daniel Magli and Priscilla Hutter. John Joseph Magli married Mabel M. Clark, daughter of Thomas Clark and Ruth Dougherty, in 1941. John Joseph Magli died on 29 June 1981 at Dane, Wisconsin, at age 69. Married Name 1941 As of 1941,her married name was Magli. Mabel M. Clark was born on 16 October 1915 at Wisconsin. She was the daughter of Thomas Clark and Ruth Dougherty. Mabel M. Clark married John Joseph Magli, son of Wilhelm Daniel Magli and Priscilla Hutter, in 1941. Mabel M. Clark died on 26 August 2003 at Dane, Wisconsin, at age 87 Mabel M. Magli, age 87, passed away Tuesday, Aug. 26, 2003, at her home while watering her beautiful flower beds. She was born Oct. 16, 1915, the daughter of Thomas and Ruth (Dougherty) Clark, in Ridgeway, Wis. Mabel was a graduate of Ridgeway High School. In 1941, she married John J. Magli in Madison. He preceded her in death June 29, 1981. Mabel worked many years in the office of Milwaukee Railroad and was a member of their auxiliary. She was a longtime member of St. Peter's Catholic Church, North Sherman Avenue, and it's Council of the Catholic Women. Survivors include a brother, Patrick (Helen) Leary of Madison; two sisters, Elaine Campbell of Henderson, Nev., and Marilyn (John) Dahlby of Cross Plains; many nieces, nephews, other relatives and friends; and special friend, Robert Frint. In addition to her husband, she was preceded in death by her parents; and stepfather, Leo Leary of Ridgeway. A Mass of Christian Burial will be held at ST. PETER CATHOLIC CHURCH, 5001 N. Sherman Ave., Saturday, Aug. 30, 2003, at 10:30 a.m. with Father Roger Nilles officiating. Burial will be held at Highland Memory Gardens Cemetery. Thomas Clark married Ruth Dougherty, daughter of Eugene Dougherty and Bridget (? ), before 1915. Married Name before 1915 As of before 1915,her married name was Clark. Married Name before 1922 As of before 1922,her married name was Leary. Ruth Dougherty was born circa 1899 at Wisconsin. She was the daughter of Eugene Dougherty and Bridget (?). Ruth Dougherty married Thomas Clark before 1915. Ruth Dougherty married Leo Leary before 1922. Name Variation Leo Leary was also known as Sam. Leo Leary was born circa 1895 at Wisconsin. He married Ruth Dougherty, daughter of Eugene Dougherty and Bridget (? ), before 1922. Eugene Dougherty married Bridget (?). Eugene Dougherty was born circa 1858 at Wisconsin. Married Name Her married name was Dougherty. Bridget (?) married Eugene Dougherty. Bridget (?) was born circa 1859 at Wisconsin. She died between 1920 and 1930. Fred Pooler Hewes Sr. was born on 2 September 1885 at Wisconsin also reported as Sep 1886. He was the son of Will E. Hewes and Elsie L. Morrison. Fred Pooler Hewes Sr. married Ellen M. Branigan, daughter of (?) Branigan, circa 1909. Fred Pooler Hewes Sr. died after April 1930. On 12 September 1918 at World War I Draft Registration, Rock, Wisconsin. [S245] U.S. Federal Census 1900 U.S. Federal Census, by Ancestry.com, Year: 1900; Census Place: Delavan, Walworth, Wisconsin; Roll: T623_1820; Page: 6B; Enumeration District: 85. [S244] U.S. Federal Census 1910 U.S. Federal Census, by Ancestry.com, Year: 1910; Census Place: Beloit Ward 1, Rock, Wisconsin; Roll: T624_1735; Page: 9A; Enumeration District: 0090; Image: 37; FHL Number: 1375748. [S243] U.S. Federal Census 1920 U.S. Federal Census, by Ancestry.com, Year: 1920;Census Place: Beloit Ward 1, Rock, Wisconsin; Roll: T625_2013; Page: 3A; Enumeration District: 84; Image: 656. [S250] U.S. Federal Census 1930 U.S. Federal Census, by Ancestry.com, Year: 1930; Census Place: Beloit, Rock, Wisconsin; Roll: 2609; Page: 18B; Enumeration District: 11; Image: 1003.0. Married Name circa 1909 As of circa 1909,her married name was Hewes. Ellen M. Branigan was born circa 1883 at Wisconsin. She was the daughter of (?) Branigan. Ellen M. Branigan married Fred Pooler Hewes Sr., son of Will E. Hewes and Elsie L. Morrison, circa 1909. Ellen M. Branigan died after April 1930. Ellen M. Branigan had 1 with 1 living in 1910 children. Children of Ellen M. Branigan and Fred Pooler Hewes Sr.
Fred Pooler Hewes Jr. was born on 6 June 1909 at Wisconsin. He was the son of Fred Pooler Hewes Sr. and Ellen M. Branigan. Fred Pooler Hewes Jr. died in March 1985 at age 75. Thomas Branigan was born circa 1887 at Wisconsin. He was the son of (?) Branigan. Thomas Branigan married Anna (?) circa November 1909.